"A few inches of snow are possible across southwest Minnesota on Friday. Very cold air will move in over the weekend. Expect temperatures to fall below zero overnight, with very cold wind chill values during the early morning." A storm system will develop across the Central US as we head through the end of the week and clip parts of southern Minnesota with snow, which could require light shoveling duties there. The heaviest snow with the system will stay well south of the state and move through parts of the Ohio Valley and Northeast once again. Here's the snowfall potential through 6PM Friday, which suggests a few inches of snow possible across the southern part of the state with shovelable amounts closer to the SD & IA border. 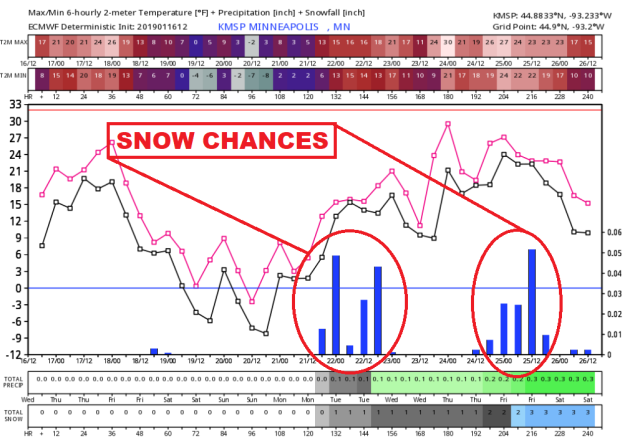 More Snow Early Next Week? According to the GFS, there is another storm system that could take a similar track to Friday's system, but could track a little farther north, which could mean more snow for us closer to home. Stay tuned! It is definitely way too early to tell what may happen as we slide into the early part of next week, however, extended model runs continue to keep an active weather pattern across the region. 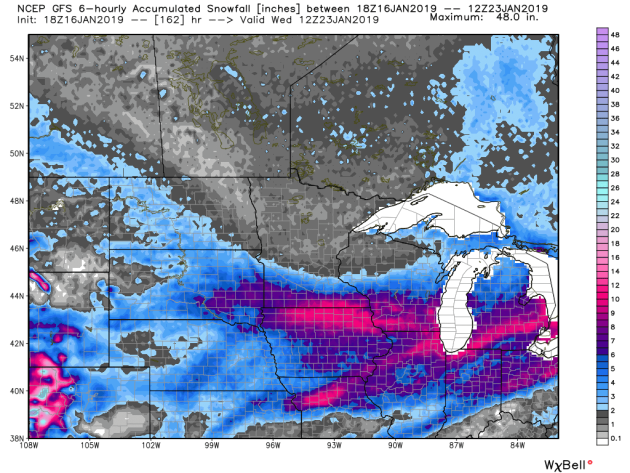 Here's a look at the GFS (American model) snowfall potential through Wednesday of next week, which suggests areas of heavier snow possible across the southern half of Minnesota. Stay tuned! Meteorological Winter is described as the coldest 3 months on average for the northern hemisphere and emcompasses the months of December, January and February. 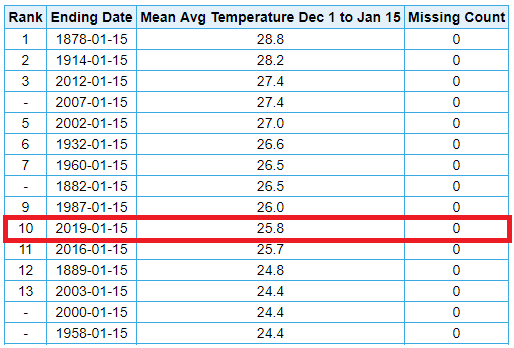 Looking at the data from MSP, the first half of Meteorological Winter (December 1st - January 15th) was the 10th warmest such periond on record with an average temp of +25.8F. If you can believe it, we're on pace to set a new record here in the Twin Cities for the latest first sub-zero temperature on record. 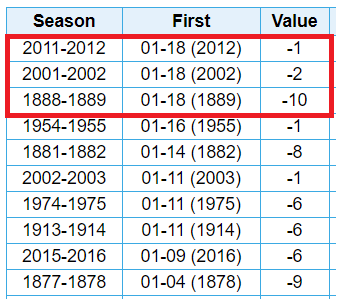 The record at MSP is January 18th, which occurred 3 times in 1889, 2002 and more recently in 2012. The forecast now calls for our first sub-zero reading of the season to happen Sunday morning, which is January 20th! Here's a look at the forecast low temperatures across the state on Sunday morning, which shows everybody going sub-zero, including the Twin Cities on the morning of January 20th. This will likely be the first sub-zero reading of the season at MSP, which will be the latest first on record! High temps on Wednesday will be quite a bit colder across the region in the wake of a weak front that brought a little wintry mix Tuesday, including patchy freezing drizzle. Note that temps across far northern MN will only warm into the single digits, while folks in southern MN will warm into the low/mid 20s. 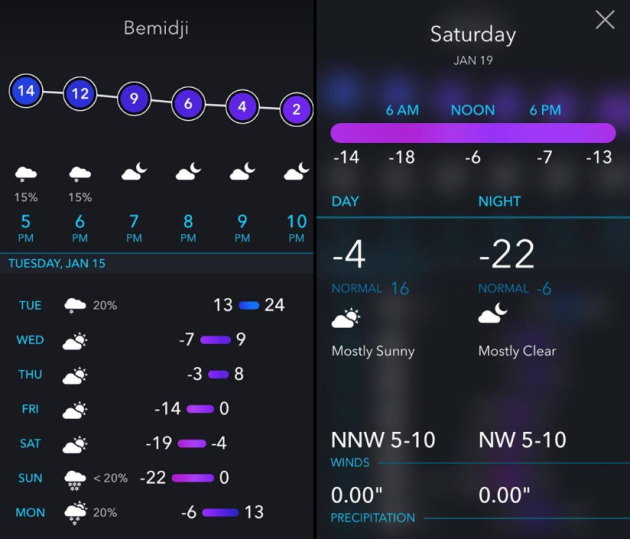 Temps in northern MN will be nearly -10F to -15F below average. 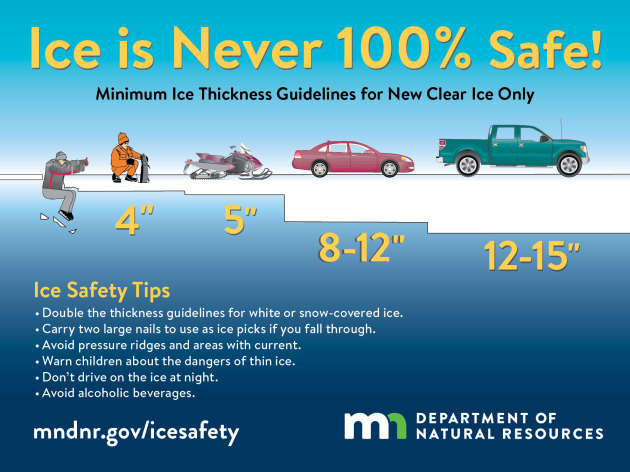 A recent tweet from @mndnr suggested that due to warmer weather, ice conditions have deteriorated in some locations. PLEASE BE CAREFUL if you plan on venturing out on area lakes/ponds!! Hey look at this. According to NOAA's CPC, there appears to an extended period of below average temperatures across much of the nation as we head January 24th - 30th. The colder air looks especially consistent from the Great Lakes to the Gulf Coast! Get ready for a true blast of winter! Here's a look at the temperature trend from Thursday to Sunday, which shows an Arctic front blasting through late week with very cold temps moving in behind it. In fact, it looks like the coldest will slide in this weekend with sub-zero temps and dangerous wind chills like through early next week! Take a look at the extended temperature outlook as we head through the end of the month and it looks like we could be in it for the long haul. The first wave of cold air arrives late week/weekend ahead and should be with us through early next week. Temps may recover a bit next week, but at this point, we could be looking at another surge of even colder air late month. Stay tuned! Note that the Twin Cities has only seen 11" of snow so far this season, which is nearly 17" below average! Interestingly, Rochester has seen more than 15" of snow this season, International Falls has seen nearly 25" of snow this season and Duluth has seen nearly 35" of snow this season. Also note that there is only one climate locations that are reporting above average snowfall for the season (Marquette, MI). Other than that, every location is reporting below average snowfall for the season. The current snow depth across the region shows pretty minimal amounts across the Twin Cities and into the southeastern part of the state. 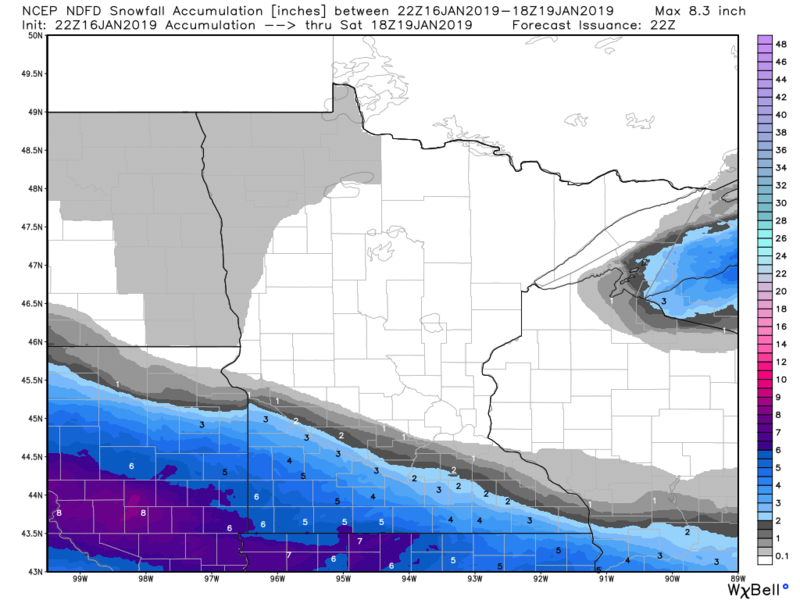 However, locations across the northern half of Minnesota shows a decent snow pack, especially along the MN North Shore, where more than a foot is being reported. Frigid? You call THIS frigid? Back in the day, when I walked to school, (uphill both ways) we didn't slap on extra layers until we couldn't see the mercury in our backyard thermometers! We had to plug in our cars and even a few slow-moving pets! It got so cold, sometimes our words froze in midair! Old fashioned pioneer winters are harder to come by in Minnesota, and saying it's going to get cold in January is like admitting you're going to get wet when you jump in a lake. It's inevitable. Arctic air rarely arrives at once, it usually ripples south in waves - each successive clipper dragging a colder cold front in its wake. Another major winter storm pushes south of Minnesota Friday, yanking the coldest air of the season so far into town this weekend. Daytime highs hold in single digits and teens Saturday & Sunday before recovering next week. No significant natural snow in sight, but it will be cold enough for ski resorts to make snow. 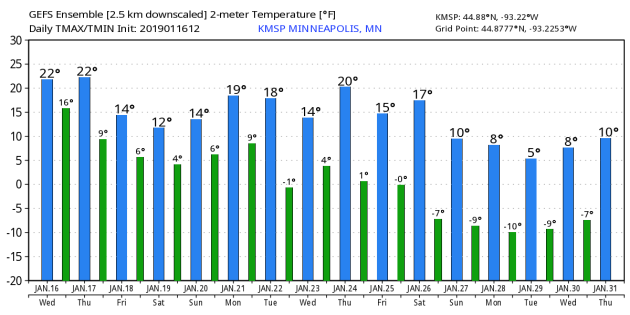 Odds still favor a new record for 'latest first-subzero low" on record in the Twin Cities. Pretty exciting, huh? THURSDAY: Flurries south, sun north. Winds: NW 8-13. High: 23. THURSDAY NIGHT: Partly cloudy and colder. Winds: NW 5-10. Low: 6. FRIDAY: Light snow far southern MN. Winds: N 7-12. High: 12. SATURDAY: More clouds than sun. Feels like -10F. Winds: NW 8-13. Wake-up: 3. High: 11. SUNDAY: Cloudy and cold. Winds: E 7-12. Wake-up: -2. High: 13. MONDAY: Light snow or flurries. Winds: SE 8-13. Wake-up: 5. High: 18. TUESDAY: A little light snow lingers. Winds: SE 5-10. Wake-up: 14. High: 21. WEDNESDAY: Mostly cloudy, not as numb. Winds: S 5-10. Wake-up: 17 High: 27. 1996: A severe ice storm hits the western and northern Twin Cities with accumulations between a half an inch and an inch. A foot of snow fell over central Minnesota. 1982: The citizens of Tower wake up to a frigid low of -52 degrees F.
"Jan. 20: Full Wolf Moon 11:16 p.m. CST - Amid the frigid cold and deep snows of midwinter, the wolf packs howled hungrily outside Indian villages. The Full Wolf Moon was also known as the Old Moon or the Moon after Yule in other cultures. In some tribes this was the Full Snow Moon; most applied that name to the next moon. This year, there will be also be a total lunar eclipse that will be visible across the entire Western Hemisphere as well as Europe and a swath of western Africa. Totality will last 1 hour and 2 minutes." "A lunar eclipse and a ‘super blood wolf moon’: how to watch this cosmic event"
"Skygazers are set to be treated to a total lunar eclipse this weekend, on top of a “super blood wolf moon.” The cosmic event is the convergence of a few stellar lunar events — an eclipse coinciding with a supermoon turning an eerie blood red. The eclipse will be visible to much of the Western Hemisphere, including Canada, the U.S., Mexico and South America on Sunday, Jan. 20, and finish early Monday, Jan. 21 (ET time). Here’s what you need to know. If you’re planning to watch the lunar eclipse, you may have to stay up a late. It begins around 9:12 p.m. ET on Jan. 20. However, you probably won’t be able to see any movement until the first phase of the eclipse, which is set to happen at 10:34 p.m. This is when the moon starts to get a little darker. Around 11:41 p.m., the full eclipse slowly sets in and then the maximum eclipse is set to take place at 12:12 a.m. Jan. 21. The total eclipse will end at 12:44 a.m. Unlike a solar eclipse, it’s completely safe to watch a lunar eclipse with the naked eye." "On January 16 and 17, 2019 – the waxing gibbous moon passes in the vicinity of Aldebaran, an ex-pole star, a famous zodiac star and the brightest star in the constellation Taurus the Bull. This is a wonderful time to learn to identify this star, even though you might have to squint a bit to see it in the moon’s glare. Aldebaran is a bright reddish star, a good star to come to know. Did you know that Aldebaran is also a former pole star? It’s true, and it’s a fascinating story. Many people know that Polaris is the present-day North Star, but few know that Aldebaran reigned as the North Star some 450,000 years ago. What’s more, Aldebaran appeared several times brighter in the sky then than it does now. Plus – 450,000 years ago – Aldebaran shone very close to the very bright star Capella on the sky’s dome. In that distant past, these two brilliant stars served as a double pole star in the astronomical year -447,890 (447,891 BC)." High temps across the country on Thursday will be fairly mild across the Central and Southern US, while folks in the Northeast will below average temps. Keep in mind that temps by the weekend and through the end of January look to be well below average across much of eastern two-thirds of the nation. Weather conditions over the next 2 to 3 days will be quite active across the country as a series of Pacific storms work across the country. Areas of heavy rain and snow will be possible as they slide east. "This One-Year Time Lapse Of The Weather In 2018 Is Breathtaking"
Do you a spare 9:45 minutes? Take a look at the weather across the country for all of 2018, it's pretty neat! "A CLEVER NEW MAP SHOWS WHICH CHICAGO NEIGHBORHOODS ARE MOST AT RISK FROM POLLUTION"
"The NRDC hopes its new research into municipal pollution can help organizers push for sound, equitable policy. Chicago suffers from inequality in many forms, including uneven exposures to pollution and toxins throughout its many neighborhoods. Now, a sophisticated new map of the Windy City shows how, even among the dirtiest streets, not all pollution is created equal. That's because some neighborhoods are better equipped to handle these environmental risks than others—perhaps because they're wealthier, or have more time, or enjoy closer access to their political representatives. Meanwhile, residents of low-income or high-minority neighborhoods can sometimes be all but forgotten by their representatives. It's a distinction of which policymakers must be mindful when planning new developments in Chicago. Created by the Natural Resources Defense Council, the new map combines both the environmental and socio-demographic characteristics of each Chicago neighborhood. It considers factors such as cancer and respiratory risks from air toxins, lead paint exposure, and proximity to Superfund sites; on the socio-demographic side, it incorporates poverty, minorities, linguistic isolation, and the percentage of young and old people." "Nielsen Sees ‘Resurgence' In OTA Households"
The number of households receiving their television via over the air antenna now represents 14 percent of all U.S. television households, nearly double what it was eight years ago, according to a new report from Nielsen. With the television industry being upended by the emergence of multiple streaming options, the result has been declining pay-TV subscriptions and the increasing use of alternate methods of distribution, including the old-fashioned TV antenna. “As of May 2018, more than 14% of all TV households—or 16 million homes—have OTA status, and that number is on the rise,” said Justin Laporte, vice president of Local Insights for Nielsen, in its latest “Local Watch Report.” “As consumers look for more on-demand and cost-effective options, there has been a resurgence in this type of television household.” In its report, which analyzes the evolving habits of viewers, Nielsen divided these OTA households into two categories: “Plus SVOD,” those households that supplement their viewing options with streaming services such as Hulu (not Hulu Live), Amazon Prime and Netflix; and “No SVOD,” households that get their television strictly via antenna. There are distinct differences in the demographics and behavior of the two types of households, according to Nielsen. "Our sun will turn into a solid crystal in 10 billion years"
"In about 10 billion years, our sun is likely to turn into a white dwarf — a shrunken, extremely dense star whose nuclear core has burned out and gotten rid of its outer layers. A new study published Wednesday in the journal Nature claims to reveal the first evidence that white dwarf stars form solid, crystal cores containing metallic oxygen and carbon. The oldest white dwarfs, the study finds, are likely to be almost fully comprised of crystals. Why it matters: The process of crystallization, similar to water turning into ice but occurring at far higher temperatures (about 10 million degrees Celsius), slows the cooling of these stars, potentially making them billions of years older than originally thought. Scientists use white dwarfs as markers of time in order to get a better idea of the age of surrounding stars and planets. What they did: Astronomers from the University of Warwick in the U.K. used observations from the European Space Agency's Gaia satellite to examine the luminosities and colors from about 15,000 white dwarf candidates within about 300 light-years of Earth." "Lots of rain in 2018 made local rivers run high and fast. Will climate change make that a regular thing?" "If you remember 2018 as being one rainstorm after the next, you aren’t far off. Last year was the second rainiest on record in Philadelphia, with a total 61.6 inches over the year. That’s only narrowly edged out by 2011 – the year of Hurricane Irene and Tropical Storm Lee – when Philadelphia soaked up 64.3 inches of rain. The cities of Wilmington and Reading, as well as the entire state of New Jersey, recorded their rainiest year. All that rain propelled some of the highest river flows on record. The Schuylkill in Philadelphia flowed at its highest rate since scientists began recording data in 1932. Ditto with the Delaware near Montague, New Jersey, where records date to 1940. In Trenton, the Delaware flowed at its second highest rate, with first place going to 2011. Carol Collier, senior adviser for watershed management and policy at the Academy of Natural Sciences, said she wasn’t surprised by the numbers given all the rain we had. But the region isn’t prepared for the higher flows and more frequent floods that could happen as a result of climate change, she said." "Antarctica's Largest Ice Shelf Could Be at Risk of Melting"
"The Ross Ice Shelf appears to be melting in previously unknown ways. The same mechanisms could be melting other giant ice shelves, too. Most of the worry over melting ice in Antarctica has focused on the rapidly melting western shore, where there is enough ice to raise worldwide sea levels by up to 4.3 feet. But new research suggests that the massive Ross Ice Shelf, which has long been considered stable, might be at risk as well -- potentially leading to a slower sea level rise of up to 38 feet as glaciers that were once held back by the shelf slide more quickly into the ocean. The researchers suspect that other crucial ice shelves could also be at risk. "My primary concerns would be that the potential for melting and collapse of the big ice shelves is not being taken seriously enough," said Laurie Padman, a physical oceanographer based in Corvallis, Oregon who works at a Seattle-based nonprofit called Earth and Space Research. "They're being treated as less important because they are not presently showing much signs of change. 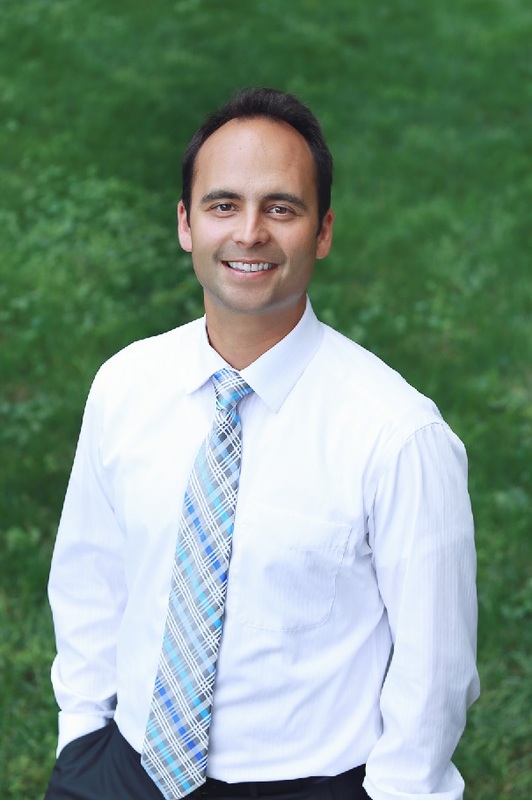 But on a 100-year timescale, they have the potential for large changes." Warm Start to winter so far, but cold temps ahead!